The United States women’s soccer team has been back in the news recently. Not because some of their players are choosing to sit out the national anthem of the country they represent, but because 60 Minutes highlighted their ongoing dispute with U.S. Soccer over their compensation . The team filed a wage-discrimination lawsuit earlier this year with the Equal Employment Opportunity Commission . 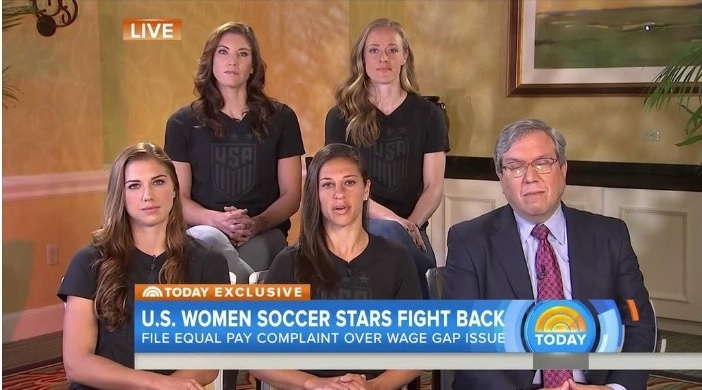 The 5 players involved in the lawsuit say the women are seeking “equal pay for equal work”. At the heart of the team’s argument is that they have been much more successful than the men’s team, and deserve to be compensated fairly for their success. While it cannot be disputed that the women’s team has accomplished much more than the men on the field, simply winning games doesn’t make you more money. After all, the Minnesota Linx, winners of 3 of the last 6 WNBA Championships, are much more successful than their NBA counterpart Timberwolves on the court. Yet the pay disparity between WNBA players and NBA players is even larger. As we know with similar allegations of discrimination in the marketplace, there is usually a fundamental economic reality at play other than people being mean to women. Is that the case here? To start, it’s hard to make a comparison because the pay structures of the men and women are much different. The men are paid on a per game basis, while the women receive a base salary and benefits. This makes any attempt at drawing a direct line tricky, but generally the women’s players do make less than the men . That being said, the reasons the women make less than the men has little to do with discrimination. For instance, the women made $2 million for winning the 2015 World Cup, while the men made $9 million in the 2014 World Cup after being knocked out in the round of 16. However, that prize money is handed out by FIFA, not U.S. Soccer. Moreover, FIFA made a profit of over $2 billion on the men’s tournament , while the women’s tournament typically pulls in less than $80 million in total revenue . Additionally, while the 2015 Women’s World Cup raked in $17 million in sponsorship revenue, the men’s tournament brought in an astonishing $529 million . Moreover, what is often ignored is the salaries the players make when they aren’t representing the national team. The men simply have more leverage when bargaining for their national team salary, as the money they can make elsewhere is much greater. The average salary for a Major League Soccer player is $316,777 , while top players like Clint Dempsey make $8 million annually . This doesn’t even take into account what male players can make in some of the prestigious European leagues, which is substantially more. Meanwhile, the maximum salary in the National Women’s Soccer League is $126,000 . The gap is explained by the fact that MLS attendance is 13 times higher than NWLS attendance   and MLS has a massive $75 million TV deal , while there is little public interest in watching NWLS games on TV. What is clear is that if there is discrimination in soccer, it is coming from a public that is mostly uninterested in attending and watching the women’s game, not from the federations that pay the players. While that may be unfortunate for a team that has had a lot of success, it is the reality. Women play against women therefore it is not equal pay for equal work. The world Cup is the most highly watched sporting event in the world. The women’s game is highly inferior to the mens. Until you have a truly open football competition where both men and women can be equally represented women can never be paid as much as me.